Induction to the AICP College of Fellows is the highest honor the American Institute of Certified Planners bestows upon a member. Fellows of AICP are nominated and selected by their peers to recognize and honor their outstanding contributions as a professional planner. The outcomes of their individual efforts left demonstrably significant and transformational improvements to the field of planning and the communities they served. All Fellows are long-time members of AICP and have achieved excellence in professional practice, teaching and mentoring, research, and community service and leadership. The College actively encourages Fellows and others to participate in programs and initiatives in the service of communities and the planning profession, including: mentoring the next generation of planners; volunteering expertise to underserved communities; leading initiatives within APA chapters and divisions; and sharing knowledge with the planning community, allied professionals, and the wider public. 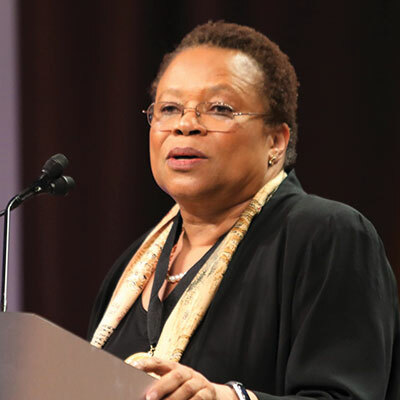 During the 2018 FAICP induction ceremony in New Orleans, new inductee Maxine Griffith, FAICP delivered the Class of 2018 speech. Griffith, who is the Senior Advisor to the President and Adjunct Professor of Urban Planning at Columbia University in the City of New York, focused on the topics of power and diversity.